Sharp, swift, swooshes of a machete echo through the deep Amazon jungle as an overgrown path is cleared from ever-encroaching plants. Beads of perspiration roll rapidly down my face. Although I am a foreigner to this land, I pause with an accustomed ear to a series of bird trills. This is no three-day Amazon jungle tour where tourists fly in and out on the first and last days; this was the Picaflor Research Centre, an eco-friendly and simple complex deep in the Tambopata jungle, eight hours upriver from Puerto Maldonado by canoe, where I and a group of others were volunteering. The Center was hand-built and designed by Dr. Laurel Hanna, a British Zoologist and her Peruvian husband Pico. While there we helped to clean trails, tended to the land to promote re-vegetation and oversaw the construction of a bird house intended for a unique type of Peruvian hen. Hence the machete and the sweat. We were working during a holiday, but reaping the rewards of staying in the jungle for a longer period. Hot and humid, the wet season was approaching and we woke with the birds to make the best of the coolest part of the day. The approach of dawn is signaled by an increasing crescendo of bird-song and the rough clatter of parrots from the trees. The din created by the cries of birds was so loud that thought becomes difficult. Transfixed, we watched as macaws and toucans flew overhead and smaller, brightly colored birds darted in every direction; the jungle was full of movement. Suddenly, silence would fall. It was as if the birds have gotten over the excitement of “happy hour” and had gone off to attend to other business. The other volunteers and I were free of guides who would distract us from the beauty of the jungle with their facts and figures. 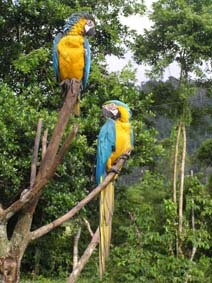 We were left to wander the Amazon trails peacefully, enjoying the serenity of our surroundings. 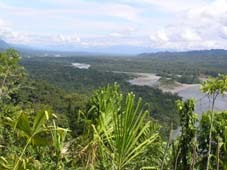 The sounds of the jungle – noises and birdcalls that seem to emanate from every leaf and tree – are more powerful than any sound created by man for surround-sound movie effects; these are faceless voices speaking of ancient mysteries. Shapes become apparent, startling in their unique variety amongst the leaves. An abundance of fungi overwhelm with their perfection, forming shapes like glassware or an earthy bridal veil. Once the eye becomes adjusted, huge insects, camouflaged into the foliage, emerge like primordial beasts. We learned quickly that crashing noises high in the jungle canopy signaled monkeys. Orange colored capuchin, with their dark faces and forearms, gaze at us curiously before bounding away. Tiny black and white Saddle Backed Tamarin, no bigger than cats, bound through the tree-tops with their family. They scamper up trees only and leap like trapeze artists to neighboring trees. Entranced by the performance of acrobatics, we would follow them through the jungle like the hunters that still pursue them. The agouti is an attractive, yet rodent like animal that furtively visited us during the day. It is a characterful animal, and they share a special relationship with the Brazil nut tree. The agouti gnaws through the hard coconuts of the Brazil Nut for the delicacy within. After freeing the Brazil nut from its hard casing it is possible for the seed to germinate. valued are the Brazil nut trees – they are found only in Peru, Brazil, and Bolivia – that they are illegal to log. However, without recognition of their value, other species of trees remain prey to illegal loggers. We sometimes heard the buzz of a chainsaw; a sound in stark contrast to the harmonious symphony of the jungle. On one occasion the owner of the lodge where we are staying set out at a fast pace to pursue a poacher and we stumbled over trees and logs in order to keep up with him. Though our lodge has conservation rights to this piece of jungle, illegal loggers had taken over twenty great giants just a month before our visit. Before our stay, a prior volunteer had posed for photographs with the loggers, flanked by their chainsaws and felled trees, which he later handed to authorities for prosecution. When we got to the source of the sound we were silenced by the destruction: gaping gashes in the canopy and huge patches of blue sky that was once filled by ancient trees. Sunlight streamed on this once moist, dark forest onto enormous pieces of partially milled, then discarded wood. Adding to the tragedy was that only one-third of the wood had been removed for timber. The remainder lay on the forest floor, left to decay. The rapid destruction of the Amazon has been reported in terms such as “football fields per day.” What we saw were a few selectively felled trees, yet it was still heart-wrenching. Each tree earns the illegal logger in the vicinity of US$1,000, a fortune in a country where the average laborer makes about US$5 per day; barely make enough to feed their families. Brazil and Peru are currently working on the “Carretera Transoceania,” a highway that will join the Pacific to the Atlantic. The road is paved and ready to go right through to the Peruvian border; it is just this region of the Madre de Dios that remains unfinished. When the road comes it will be seen by the millions of poor in the Andes as the road to richness, creating an influx in immigration. The concern is that this pressure on the fragile jungle will cause this delicate eco-system to spiral out of control.